Learning about sustainable seafood on a Galápagos cruise seems paradoxical: Observe the beauty of marine life, then eat it? But writer Dominique Browning learns why it makes sense with help from star chef Bruce Sherman. Reaching the Galápagos Islands, the legendary archipelago 600 miles off the coast of Ecuador, had once—a mere 10 years ago—felt like a journey to the end of the earth. No longer. Opinion was divided when I told friends where I was headed. “Stunning. It changed my life,” said one. “The Galápagos? It’s over—ruined,” said another. “Don’t bother.” Indeed, in 2007, UNESCO put the Galápagos on its list of world heritage sites in danger. Cruise ships, carbon miles! Was it wrong to go? Why not just stay home and watch Planet Earth? The answer surprised me. I was making this trip under the auspices of Lindblad Expeditions. Lars-Eric Lindblad has been called the father of ecotourism because his expeditions in the 1950s to destinations like Easter Island, the Amazon and the Galápagos were run under the philosophy of experiencing a place, appreciating it and leaving it untouched. In 1979, his son Sven founded Lindblad Expeditions, a ship-based extension of his father’s trips. More recently, the company has created local conservation and philanthropic initiatives to help combat the impact of large-scale tourism. And last year, Lindblad Expeditions partnered with Chefs Collaborative, a U.S. nonprofit network of more than 5,000 eco-minded members, to launch Chefs-at-Sea. The goal of the program: to teach passengers sustainability lessons that they can bring back home. Joining me onboard in the role of teacher was Bruce Sherman, an F&W Best New Chef 2003 and the chef-owner of the Chicago restaurant North Pond. Sherman is one of a handful of big-deal chefs—among them Michel Nischan of the Dressing Room in Westport, Connecticut, and Barton Seaver of Blue Ridge in Washington, DC—giving cooking demonstrations and lectures on Lindblad sailings. A program on sustainable seafood, on the face of it, seemed paradoxical: Observe the beauty of marine life, then eat it? But Sherman later explained that learning about sustainable ingredients in the Galápagos is as valuable as learning about them in Illinois. “It just seems more exotic,” he says. Lindblad Expeditions challenges its guests to actually think about the environment they are visiting. A reading list arrived at my apartment a few days before departure, and I was deep into the history of the 19 small islands—read during the eight-and-a-half-hour flight from New York City to Ecuador’s largest city, Guayaquil—by the time we departed for the islands. I stowed my stuff and nestled into my bunk, making myself at home for the next seven days, feeling as if I were at a gently rocking summer camp, waiting for the horn to blow reveille. The National Geographic Islander, one of five ships in the Lindblad fleet, is a handsome, twin-hulled, relatively small (164-foot) vessel that carries a maximum of 48 passengers. While we had all the comfort we needed (a spa and fitness center, hammocks and chaises on deck), this was not to be a cruise of ballrooms and swimming pools. Instead, the Islander felt like a minimalist-luxe expedition ship of which Darwin himself would have approved, with dark varnished-mahogany interiors and comfortable lounge and library areas. The dining room had communal tables covered with starched white linens. Breakfast and lunch were simple and served buffet-style: local fruit and juices, eggs, South American fair-trade coffee. Dinner, served à la carte by a crew wearing naval whites, included South American–inspired dishes like chicha morada, a traditional Peruvian drink made with purple corn and sweet spices, and locro quiteño, an Ecuadoran potato-and-cheese soup. Lindblad’s chefs are fanatical about sourcing ingredients. They serve only local fish, like Galápagos Almaco Jack and yellowfin tuna, which are caught by hand-line (a more ecologically sensitive fishing technique). And they will not serve shrimp, for example, because they can’t find a local, sustainable source. Two days before we set sail, Sherman explored the Quito fish and produce markets to get ideas for ingredients to use in his demos. “I saw a gorgeous spiny lobster, but Lindblad’s team said that in the last two years, they had become endangered in this region,” he told me. Ultimately, he decided on wahoo, a lean, meaty fish. In spite of every book I had read and every photograph I had seen, I was completely unprepared for the hard, strange beauty of the Galápagos. Just the smell and the sound—the racket—of it were shocking. Nearly 9,000 species of plants and animals live here, some nowhere else. Much has been written about how tame they are, but I would call them indifferent—and it’s unnerving to walk among them. It is profoundly moving to realize that humans need not be fearsome. This is what it must have felt like in some Edenic past—except that this was a searingly hot and arid environment inhospitable to human life. The first permanent settlers didn’t come to the Galápagos from Norway until the 1920s, and their lives were rough. Darwin himself (born on the same day as Lincoln, by the way) spent only five weeks here, in 1835; 19 days on land. The national park was created in 1959, preserving 97 percent of the landmass of the archipelago, leaving three percent for the human population. When we snorkeled, the black shadows of large rays passed across the seabed; colorful eels unfurled from crevices. Black lava rocks jutting into the ocean were blanketed with spiny lobsters. I remembered reading about how the beaches of Maine once crawled with lobsters; the crustaceans were so plentiful, they were fed to prisoners. The Galápagos gives you a glimpse into a time when the world’s seacoasts teemed with life. It was normal to have gigantic sea turtles swim past us and sea lions peer into our masks, locking eyes before wheeling and diving, playfully flirting. These animals are hardly tame, as we learned when a guest wandered too close to a male sea lion; the bull raised its head and roared loudly. The guide described them as being “ecologically naive,” meaning they had not (yet) learned to fear humans. I began to realize how deeply humans, by contrast, have become ecologically cynical. Our snorkeling expeditions made me even more curious about Sherman’s lessons on sustainable seafood. He told me he had requested the Galápagos assignment especially because the seasonal, local, ingredient-driven French-American food he cooks at North Pond has nothing to do with South American cuisine. He wanted to show guests how the values of well-crafted dishes made from sustainable ingredients transcend place. In his “classroom”— three tables and an electric burner in the lounge—Sherman told us how over the past several decades, boats plundered the waters around the Galápagos, netting tuna, dolphins, tiger sharks, sea lions and sea turtles—a horrific sight, and a wasteful way of fishing, given that much of the catch would be thrown away. Today, no one can (or will) quantify the extent of damage done to the marine preserve, or the waters just outside its boundaries; regulations are now more strictly enforced by the Ecuadoran government. Sherman put a lot of care into selecting the dishes for his demos. “It’s not about teaching people to cook with a funky plantain only available in Ecuador that they won’t be able to find back home,” he said. He had decided to prepare a nutty, slightly crunchy quinoa salad flavored with bacon. Quinoa, a grain similar in texture to couscous, is native to the Andes and grown by farmers in Ecuador (and the U.S., too). Sherman rinsed the quinoa in a strainer to remove its bitter, soapy coating, then stirred it into a pot along with bacon, shallot, chicken stock and a sprig of sage. While it simmered, he told us that quinoa was once called the gold of the Incas because the grain, a complete protein, provided them with “magical” energy. “Today, bacon adds magical flavor to everything,” he joked. And that struck me as getting close to the best reason to see the Galápagos. Tourism isn’t going to end, and neither is human habitation. We’re going to trespass, even if lightly, into paradise. We come with waste, bilge water, plastics and fumes; we’ve left behind a garbage patch the size of Texas floating in the doldrums of the northwest Pacific. But we also come with wonder. Yes, the human hand has troubled the waters. But the human mind will discover a way to restore them. Dominique Browning, former editor-in-chief of House & Garden, is the author of Around the House and in the Garden. Her forthcoming memoir, Slow Love, will be published next spring. 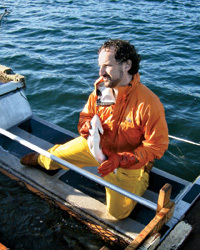 For future Chefs-at-Sea program dates and itineraries, go to expeditions.com or call 800-EXPEDITION.